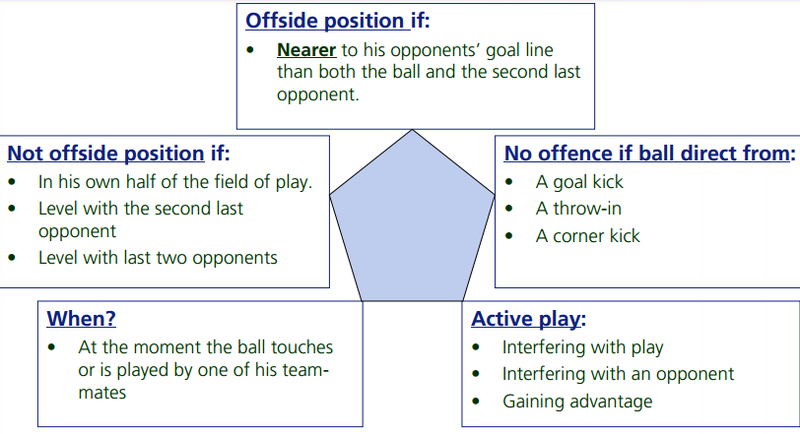 Wikipedia article on "offside" is very comprehensive and largely based on the official FIFA's Laws of the Game. Offside is a law in football which states that if a player is in an offside position when the ball is touched or played by a teammate, he may not become actively involved in the play. A player is in an offside position if he is closer to the opponent's goal line than both the ball and the second-to-last defender (which is usually the last outfield player), but only if the player is on his opponent's half of the pitch. If you see that the line going through an offending player who is about to receive the ball is closer to the goal than the line going through the last defender, and that line is in the defending half, then it is an offside. by "involved in the play" we mean that they are likely to either receive the ball as a result of the pass in question or are able to influence the outcome of the play in some other way. A player would not be considered involved if he is on the other side of the pitch with the ball going away from him. Refer to the Laws of the Game (PDF) for more info. Notice that there are a few exceptions when someone can be or not be offside. When a ball is brought back into play after it left the pitch, one can never be offside. So, one can never be offside after directly receiving a ball from a throw-in, goal kick, corner kick or a kick off (of which the latter two are rather trivial). From a (indirect) free kick one can be called offside, since the ball had not left the pitch. Suppose someone shoots for goal while his teammate is in offside position. When the ball then returns from the post, the bar or even the goalkeeper and comes in the possession of the teammate, he is still offside. Offside is not bounded by the lines of the pitch. So, one can still be offside or prevent an opponent from being offside while being out of play. See gbianchi's answer to this relevent question. I've noticed that football players often talk about being level with the second last defender; but the FIFA offside rule is now much more precise. At the instant the ball leaves the attacking player the offside vertical plane is fixed at the part of the second defender (other than his arms) which is closest to the goal line. At that instant, if any part of another attacking player has any part of their body (except the arms) beyond that plain they are potentially offside. There is a pretty nice guide which explains the concept in detail, with illustrations. In addition to posdef's answer: you can be in an offside position if a player passes backwards as much as with a forward pass. As long as the player stays behind his teammate it does not matter in which direction the pass is given. But if he is in front of his teammate and gets the pass played at him in backward direction he is still in an offside position. I used to help ref soccer games when I was younger and the way I was taught to call the off-sides penalty was that if the player on offense was beyond the last defender (goalie doesn't count obviously) before the ball was also beyond the last defender, then the player is off-sides. Some people (myself included) think the way it should be called is that the player on offense needs to be even with the defender, but should be allowed to pursue the ball as soon as it is passed to them, regardless of their position relative to the other teams defensive players. In other words - let one players speed and instinct give them an advantage - rather than a penalty. The offside rule states that if the attacking player receiving the ball is behind the last defender (not including the goalkeeper) at the time the ball is played through to them they are deemed offside. However this rule does not apply in the event of a throw-in and can only be enforced if the player is inside his attacking half. Not the answer you're looking for? Browse other questions tagged football rules officiating or ask your own question.